I was way late to the party, but have been using and enjoying Seesmic Web for the past few weeks. It takes the chaos and user-unfriendliness that is the native Twitter web site, and makes it darn near usable. I like the way I can select, see and manage three columns of content on one screen. I keep my main feed in the first column, and either a saved search or one of the lists I follow in the second or third column. Today, Seesmic updated the app to include some really helpful new features. One of those is pretty close to the feature I asked for the other day- better subscription management. Click on it, and you get a screen and toolset that makes managing your follows a lot easier. Click on the “following” link beneath your photo, and you get a list of the people you follow. Click on a person, and you get a screenful of information. 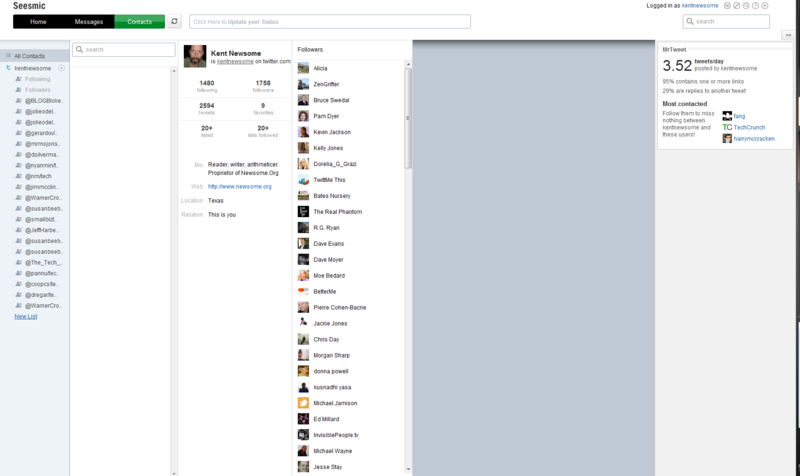 From this screen, you can also send a message or unfollow someone. Not perfect, but better. It’s also easy to manage lists from this screen, and like Facebook, lists are crucial to an efficient Twitter experience. The new version still has some issues. I’ve had some log-in problems, lockups and script errors in Firefox 3.5.8, and the All Contacts button doesn’t seem to work after you view a contact’s details. But it’s a definite step forward. Posted on February 22, 2010 January 2, 2013 by KentPosted in TechTagged seesmic, twitter. Previous Previous post: Are We Talking Ethics or Grudges or Just Funny? thanks for your review, we are still pushing the new update, so it's normal that all the features aren't up yet. Thanks Loic. Again, great app.Any plans/chance for bit.ly integration at some point? I should. that would ruin his little Twitter plan :)But I think he gets an exception. Along with Bill Gates and a few other “unfriendly” types.Actually, I am honored just to follow the Dalai Lama. There aren't many people I would say that about. Personally I prefer Twhirl when on the Mac, but Tweetdeck is pretty good to. I'm curious Kent, which app do you use on iPhone to do your tweeting? One of the things I really like about Seesmic is that it's completely web-based. I don't have to install anything on my computer. I've used Tweetdeck (not the latest version), and I like it. But not as much as Seesmic.I use Tweetie on my iPhone.